Being from the third generation of a family that has lived and breathed the construction and drainage industry in Liverpool Cheshire and Wirral for over 70 years, its safe to say we have gained a vast wealth of experience on the fabric of buildings and drainage systems that serve them meaning we fully understand how to install and repair drainage in a suitable manor that best suites the site conditions. Chapelgate has experienced drain engineers who specialise in new drain installations and repairs operating locally in the Wirral Cheshire and Liverpool areas. 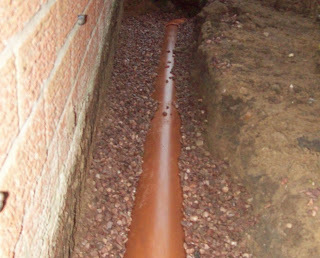 When repairing or installing a new drainage systems no matter what the intended purpose it is important to make sure the drains and pipes are installed correctly to prevent problems in the future. Chapelgates professional plumbing and drainage engineers can install any type of drain system that is required, We offer these drainage services to domestic and commercial clients in the Wirral and Liverpool area.We do not hide from the fact that we are a business and need to make a profit on drainage repairs,but customer service and satisfaction always comes first and is never compromised for profit, we offer value for money on all drainage Installations and provide a fixed cost estimate for all our drian repair and installation work. Design and installation of new drainage systems. Design and building of manholes and drainage access points. Unblocking clogged drains in Wirral, Liverpool & surrounding areas. Re-lining of drains using the latest in no dig technology.